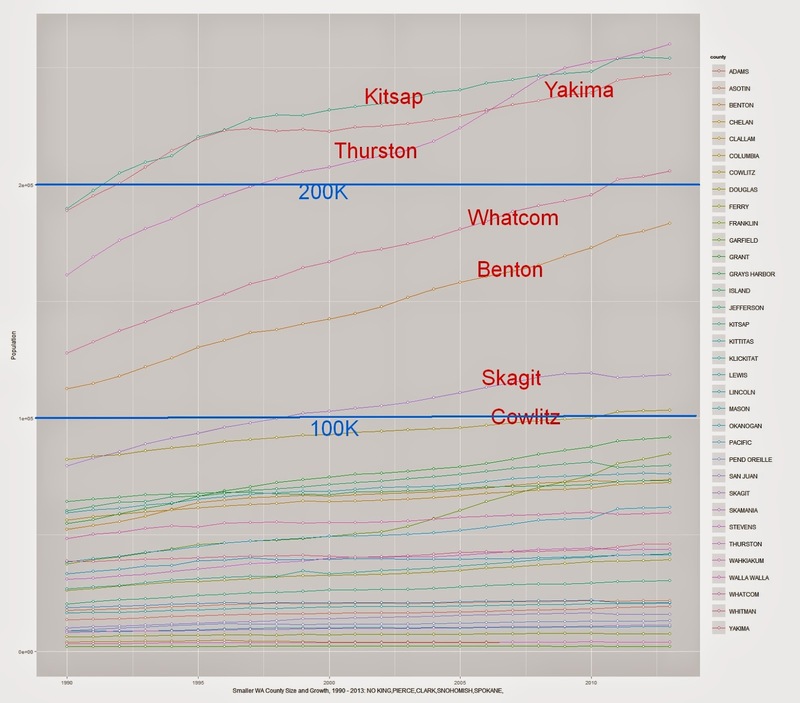 Above: Population Growth of WA counties: 1990 - 2013. Click to Enlarge. Before I start with a statistical piece on the growing population of WA, I want to tell a story; a violent story. In fact, this was the last violent episode we had to endure/know/witness as my wife and I were leaving Oakland for Bellingham. Although it was hardly the most violent memory or story I can tell, it was a story that meant something to me years later. We were packing that day. Preparing for a huge move and change in our lives that would eventually take us to where we are now: proud but exhausted Bellingham parents and homeowners. In Oakland, CA there is a considerable amount of gun violence and death. Generally, Oakland's population of 400K compares in yearly homicides with those murdered in WA state which currently has a population of about 7M. That level of crime has widespread socioeconomic effects and changes the nature of law and justice in your city and county. My wife had just arrived home, having taken the 35th ave exit off highway 580. She told me there was a cop car parked on the side of the highway and some confusion at the off ramp. I turned on the news to listen and read the papers the next day. Something tragic had happened: an officer in his cruiser had been shot. In this crime, a young eighteen year old had procured for himself a high powered rifle, stationed himself in a room next to the 35th Ave off ramp, and shot the first police officer he saw exiting the highway. As I recall the story, this young man did not have any serious criminal record and was not wanted on any outstanding warrants. The source of his anger was simply his perception of how the Oakland Police Department had mistreated his older brother. He let them know this after they arrested him and proceeded to stop talking. When I read this printed recollection to my wife, she asked me to remember that Oakland was not always a homicide capital. Both my wife and I are multi-generation Oaklanders whose parents chose to live and raise families here because they thought it was fine town. For our generation however, narcotics trafficking, increasing density and 'crack cocaine' changed the livability equation, especially for those of us from east Oakland. To a stranger from Bellingham, WA, my story might just seem like another tragic episode from the big city. But if you were raised in Oakland, you can't help but reflect on the social relevance of such an incident. When crime (especially narcotics trafficking) has taken over a city for some length of human generations, when your police force has been characterized as 'militarized' long before that characterization became common, a terrible relationship develops between those designated to keep the peace and your community. That relationship becomes tenuous, overwrought, overcharged, and sometimes violent. By the time you've got to the point where random, bitter, aggrieved 18 year old males are shooting cops in their cruisers, you have essentially lost the war; no many how many daily battles your heroic, expensive, well trained law enforcement sometimes win. This outcome is not the community relationship we need to grow strong and prosperous cities in WA. In the dynamics of a city like Oakland, law enforcement is not necessarily seen by all the community as keeping the peace or solving for crime. They become seen as a police state chasing the effects of poverty, amid a charged political environment that alleges racist and classist brutality. The resulting social relations from that outcome create a tough place to live. In the 1960s, Huey Newton reputedly handed out shotguns in Oakland as a response to police brutality. "Arm yourself or harm yourself, brother", was Newton's reputed catch phrase. Reading about Oakland today, I have to wonder if the relationship between the police and the public is any better now than 40 years ago. How do we avoid such an outcome as our cities and state grow in WA? Here is my answer: At all costs, reproduce an environment of economic prosperity for your citizens. I will talk more about how this can be done in another post. 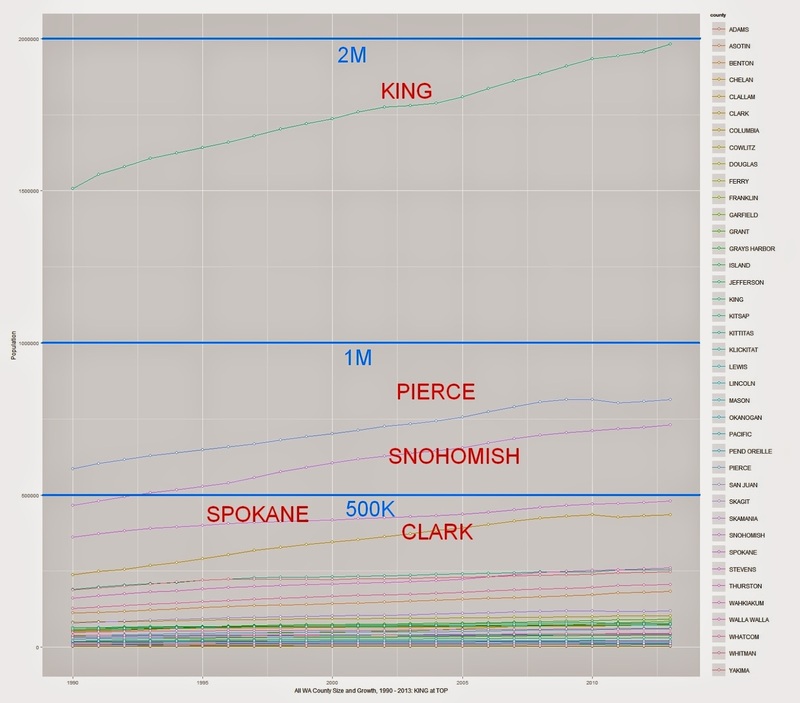 But first, let us examine just how fast WA state is growing. The table below is the top ten for net growth between 1990 and 2013 ranked in descent by the difference in county populations between those years (e.g. column 'diff'). The column 'rate' is '1 - (pop1990/pop2013)'. The top five counties added nearly 1.3M in those 24 years. The second five, approximately 370K. Now let us look at the bottom twenty counties in total population growth for those same 24 years. Some of these counties may appear to have growth rates matching the above table. But in fact, most of these counties are still quite sparsely populated. These twenty counties have added a combined total of only 119K to WA population over those 24 years. This result means that the bottom twenty counties for net growth in WA have accounted for only 7% of the growth of the top ten counties in WA in the last 24 years. How fast will these medium sized counties grow and how will the prosperity of their citizens grow? These are critical questions that need to be answered in order to develop economic and law enforcement policy in a growing rural WA. More recent data is available from OFM covering the years 2010 - 2014. Although the more recent data confirms growth in all parts of WA, my biggest takeaway is the continued growth of King County. The top image in red is top 30 county growth by volume between 2010 - 2014. Left side is inclusive of King County. The image in blue below is top 30 county growth by volume between 2010 - 2014. Left side is inclusive of King County. Click to enlarge these panoramas. R Code for this post is here.